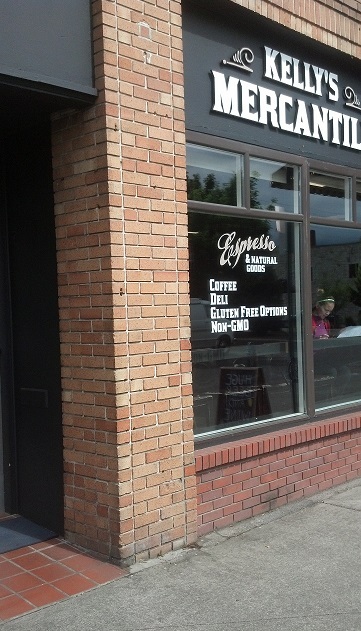 Not what you want to hear from the woman behind the showcase of amazing deep-dish pies with names like Caramel Lush and Cherry Almond Crunch — unless you’re happy to hear that bicycling really means business for Enumclaw. “Is it the bike race?” I asked. I asked if she got business throughout the year from other bike travelers. “All the time,” came the reply. It’s only about a 4-1/2 hour bike ride from Seattle so this pie ride is under serious consideration at our house — just as soon as we finish the whole apple pie we bought that must have weighed five pounds. This past weekend Enumclaw hotels, motels, campgrounds, restaurants, pubs, coffee shops, and the Pie Goddess (yes, yes she is) did a brisk business selling calories galore and a place to rest a tired body to a pack of hungry bike racers and their family members in town for the annual Mutual of Enumclaw Stage Race. We packed the racing gear for my sweetheart and camped at Kanaskat-Palmer State Park. If you’re not in town for the racing you could camp out, bike to town for treats, and bike back to sleep among the pines by the Green River; it’s just over 9 miles one way to the quiet, walkable streets near Pioneer Park. My personal Driver Courtesy-O-Meter gave Enumclaw gold stars for the drivers who stopped to let us cross when we hadn’t even stepped off the curb and their generally slow pace through the part of downtown with lots of little shops and people walking around. Cat 3 racers start Sunday’s road race in the face of rain and a killer climb up Mud Mountain–4 laps, 4 climbs. Racers ranged in age from 37 junior racers ages 10-16 up to master’s class 50+, with family names showing up in more than one category to highlight traditions of bicycle competition. 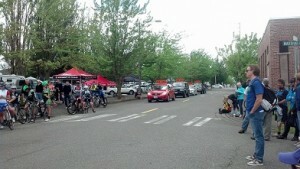 Boys and girls, men and women — around 270 racers gave it their all through the time trial and criterium on Saturday and the road race up Mud Mountain in the rain on Saturday. Oh — and the adorable kidlets on their push bikes and spider bikes tore it up in their own special races before the start of the road race on Sunday. Categories: Up to 6 years old, 6-8, and 8-10. 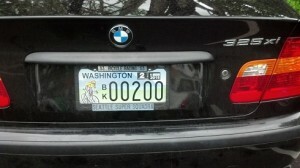 Low Share the Road plate numbers are a point of pride for many bicyclists in Washington state. The parking filled and emptied for the various stages, with licenses from British Columbia and Oregon sprinkled among the many Washington plates. 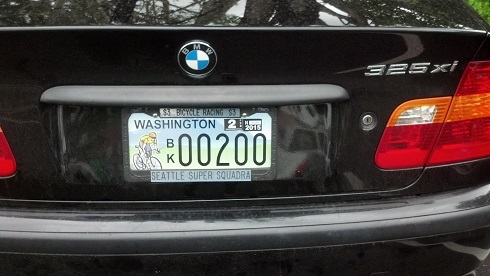 Among them: at least half a dozen Share the Road plates, including this low-number treasure. Bicycle racing relies on dozens of volunteers who plan and mark the course, officiate, drive lead and follow cars, tally registration and results, and more. That means a single race brings perhaps 200-400 or more racers plus family members and support to town. 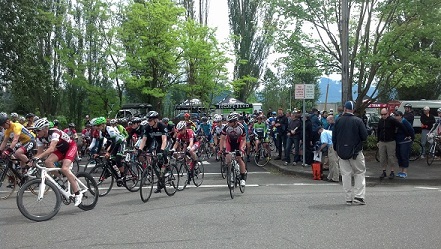 A stage race or omnium like the ones in Walla Walla, Wenatchee, Enumclaw, and elsewhere with their three race types (time trial, crit, road race) bring people to town for at least two nights and two days — a good-sized impact in the towns that play host to these events. Women line up waiting for their start, while the follow and wheel cars take their places behind and spectators line the street by the downtown park. 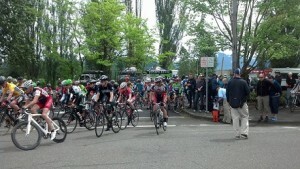 Watching a crit provides great viewing, with racers sweeping around tight turns in downtown every few minutes. The loud whirring of the wheels warns you they’re coming back around. (Don’t stand close to the edge on corners — they really lean in.) It’s over pretty fast — they go as many laps as they can in the time allotted, perhaps 30 minutes. After a road race pack takes off, by contrast, family members have 3 or 4 hours to kill depending on the distance — maybe more, if your racer wants to cheer on team members coming in with other packs after he/she finishes. 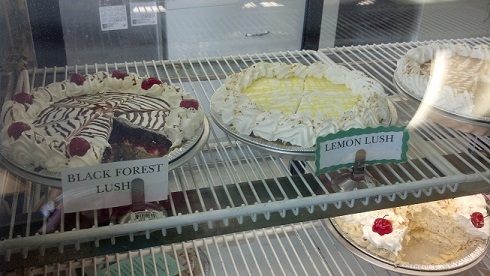 Fortunately, downtown Enumclaw offers — in addition to that killer pie — a variety of shops and restaurants in which to pass the time. They’re all just a block or two from the downtown park where the race starts, making it easy to support your racer and local businesses. 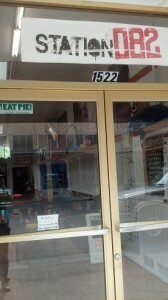 Check out Kelly’s Mercantile — the Merc — for local food, vegan and gluten-free offerings, a line-up of beers and wines, espresso and sandwiches, and free wi-fi, with open mic Thursdays and live music on weekend evenings. The Sequel Bookstore & Espresso sits on the same block, also offering up free wi-fi and plenty of reasons to hang for a while if you’re a reader. Sweet Necessities for ice cream and housemade salted caramels. 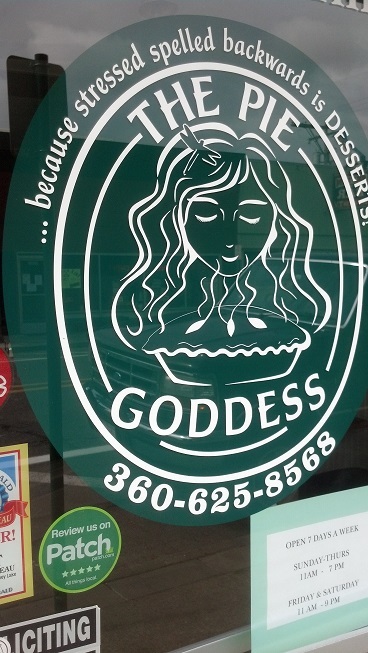 Say, get some ice cream, stop at Pie Goddess, and you’re a la mode! 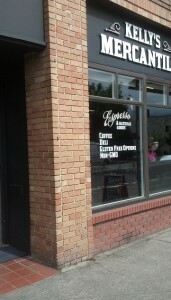 Enumclaw Day Spa Salon & Boutique sits just a block from the race starting line. 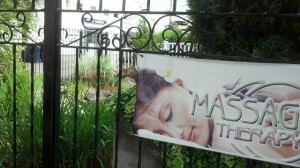 I also took note of the calming back yard of the Enumclaw Day Spa on the same block as the starting line, which gave racers a coupon for a discount on post-race massage. Hey, honey, if you’re not using that coupon…. 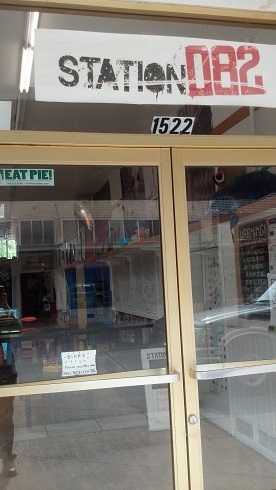 If you have kids in tow who aren’t racing, you may want to check out Station 082 with its social space for gaming and the great handwritten welcome sign on the door. 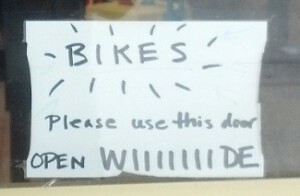 Welcoming sign for bikes at game stop Station 082 in Enumclaw. I didn’t have time to check out the shops selling home decor, antiques, consignment clothes, and other funky items. I know I could spend the day poking around pretty happily. Now that I’ve been to Enumclaw I’m playing with the map to put together a little weekend jaunt. From Seattle we could head to Issaquah, stop there for lunch, be in Enumclaw in time for dinner, spend the night, and come back the next day. 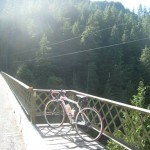 — You folks in south King County, how would you get back to North Seattle without retracing the route for day one? — What other towns do we want to ride through, and does this turn into a three-day weekend? (Will brake for pie. 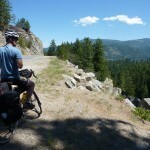 For bike travel news, sign up using this form. 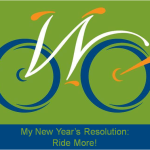 You’ll receive our e-news and occasional updates on bike travel posts, resources, and tips. 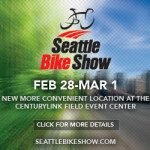 By filling out this form, you opt in to receive email updates about bicycling events and issues in Washington State. This article was posted in Enumclaw, News, Racing, Travel. Bookmark the permalink. Follow comments with the RSS feed for this post. Both comments and trackbacks are closed.